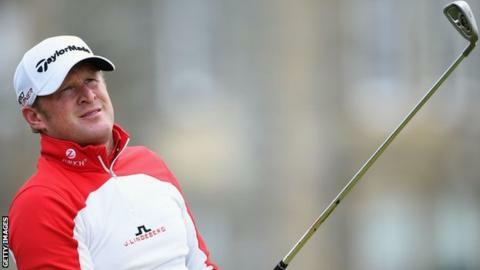 Jamie Donaldson was left ruing an "average" third round at The Open as he failed to take advantage of favourable conditions at St Andrews. The wind which disrupted Saturday's play had subsided on Sunday, but the Welshman struck two bogies on his way to a round of 71. That left him 10 shots behind joint leaders Jason Day, Louis Oosthuizen and amateur Paul Dunne. "It was average. I didn't know what day it was at the start," said Donaldson. "Sometimes you just have a day off and lose a bit of momentum. "It was so easy out there to start with and, when the rain came in, I made a bogey [on the 12th hole] which was sloppy and never got going after that." After torrential rain had caused a three-hour delay on Friday, strong winds almost wiped out play on Saturday, meaning the third round was switched to Sunday and the final round moved to Monday for the first time since 1988. But the weather was placid on Sunday, allowing the vast majority of players to record low scores and move up the leaderboard. Donaldson felt his inability to seize on those conditions represented a missed opportunity. "Absolutely. I should have kicked it round in four or five under, but I didn't, so it's a bit disappointing but that's golf," he told BBC Wales Sport. "It was very easy out there and I needed to take advantage of the easy conditions, and I didn't. "Overall, it was pretty average. Tomorrow's another day. There's no reason why I can't go out and shoot seven or eight under."